Tim Hall is an internationally recognized competitor and Ringen coach at Capital Kunst des Fechtens. 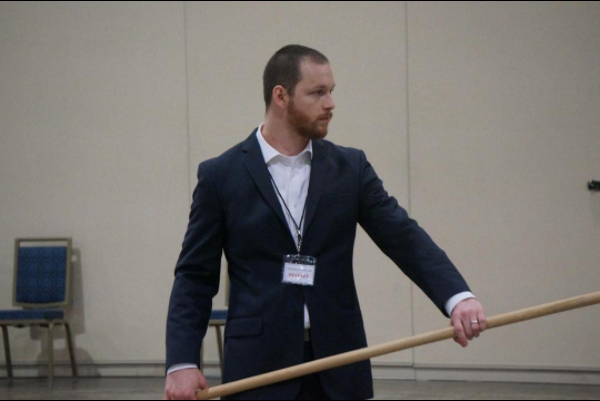 He is a Certified Instructor under the HEMA Alliance, certified Personal Fitness Trainer, and a co-founder of the US Historical Ringen Association- an organization dedicated to advancing the study and practice of medieval wrestling in the United States. Tim’s first steps into the wrestling world were as a member of a local Folkstyle wrestling team. Over the past 15 years, he has participated in a variety of other wrestling arts including Judo, and Brazillian Jiu Jitsu. He has been an avid student of Liechtenauer’s Kunst des Fechtens for nearly a decade with experience in the use of a variety of medieval and renaissance weaponry. However, his primary focus has been reviving medieval wrestling, and his extensive wrestling background has helped him to understand the medieval wrestling treatises. Tim has played a role in developing multiple US based Ringen programs through either active coaching or consultation. He has directly trained some of the most successful US competitors, and takes pride in their ability to succeed using techniques described in the medieval wrestling manuscripts. Tim is regularly invited to teach at major HEMA Events. As tournament manager for Longpoint’s Ringen Competition Tim has cooperated with other Ringen competition managers to encourage the growth of the competitive Ringen scene. Tim regularly manages, referees, or consults for smaller US based competitions as well. Tim has participated in a number of public demonstrations to spread awareness of Ringen and HEMA, including a local TV segment on medieval combat. In addition to his active social media presence, he has authored and contributed to HEMA specific articles published online. Tim recently won gold medals in Ringen at Longpoint and Swordfish 2016, as well as the technical award for all Ringen divisions at Swordfish 2016.